Fat-washing cocktails has become popular in the last decade. This technique has made it possible for bartenders to create drinks such as the Benton’s Old-Fashioned, a bacon-infused bourbon cocktail, and a milder pecan-butter-infused bourbon. In this blog post, we discuss this innovative cocktail technique and how it can be transferred to an industrial scale. 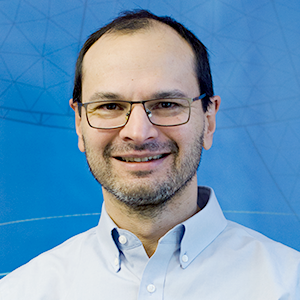 In fact, many chemical processes in a variety of industries already use similar methods. The purpose of fat-washing is to extract flavors contained in fats and oils from meat and vegetables. In the fat-washing process, some of these flavors can be dissolved in ethanol, which has the ability to dissolve both hydrophilic and hydrophobic solutes. For example, water-soluble lemon juice can be mixed with the fatty acids from pecan butter to create new flavors. The ability of ethanol to dissolve both polar and nonpolar solutes is what gives wine and liquor their flavor complexity. It is also the main reason for the variety of tastes that can be obtained when using ethanol as a solvent. For instance, the use of oak barrels for distilling whiskey and making wine adds complexity to their flavor due to the ethanol that dissolves the solutes contained in the oak. These solutes simply can’t be dissolved by water. Fragrances and flavors may be extracted by mixing solvents like ethanol with oils. The phenomena and processes involved in making fat-washed liquor are also found in industrial processes for the household product, cosmetic, pharmaceutical, and food industries. These include processes for recovering vitamins, separating flavors and fragrances, decaffeination, and many more applications. Let’s look at the steps for fat-washing liquor and how they can be scaled up to an industrial process. The first step of the fat-washing process is to melt or dissolve the meat or vegetable fat. If there is a solid matrix, we also have to extract the fatty flavors from this matrix. Extracting the flavors from an oak barrel is an example of this process, called leaching. To melt the fat in an industrial process, we can use a mixer equipped with a heating mantle. 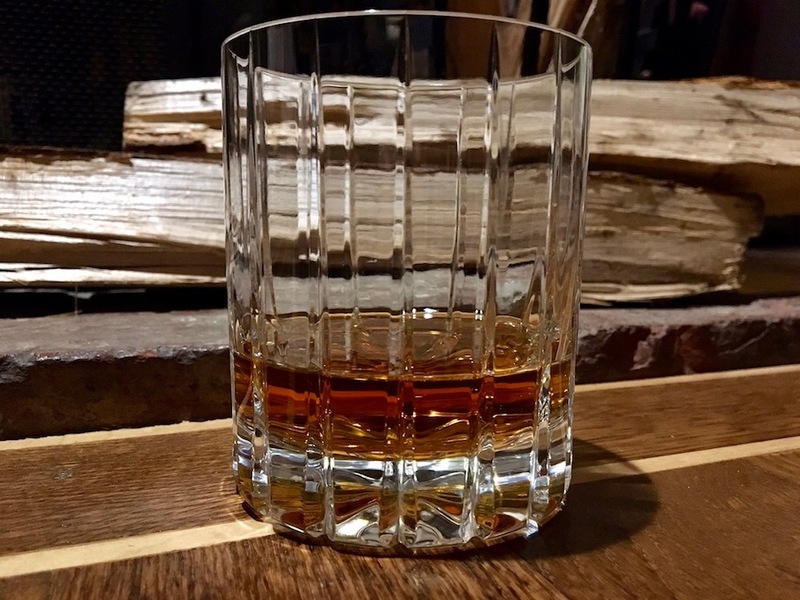 As for the extraction via leaching, it’s possible to use methods similar to those used when making whiskey, but in most cases, we can simply grind the solids to increase the extraction rate. For example, toasted oak chips are used to make oak-infused vodka. If needed, the next step is to remove the solids from the molten fat or oil. Bartenders can do this with a strainer — a process that is referred to as filtration. At an industrial scale, we can replace the strainer with a belt filter, which has a filter cake that can be removed. To avoid the oil solidifying into fat, the filtration needs to be done at an elevated temperature. The Hawthorne strainer is an important piece of equipment for the unit operations involved in cocktail making. After filtering the oil, a bartender pours it into a shaker and mixes it with liquor. To scale this process up, we would have to feed the liquor and oil into an extraction column. During the extraction of flavors, we have a two-phase system: an oil (molten fat) phase that may dissolve hydrophobic flavors and an ethanol phase that may contain both hydrophobic and hydrophilic flavors. Now, we have to transport the flavors in the oil phase to the ethanol phase, a process referred to as liquid-liquid extraction. During liquid-liquid extraction, we need to maximize the size of the phase boundary per unit volume. We can achieve this by creating the smallest oil droplets possible in the ethanol, hence the importance of mixing during extraction. A bartender simply shakes the oil and ethanol mixture. This creates a lot of droplets and also enhances the transport of solutes within each phase. 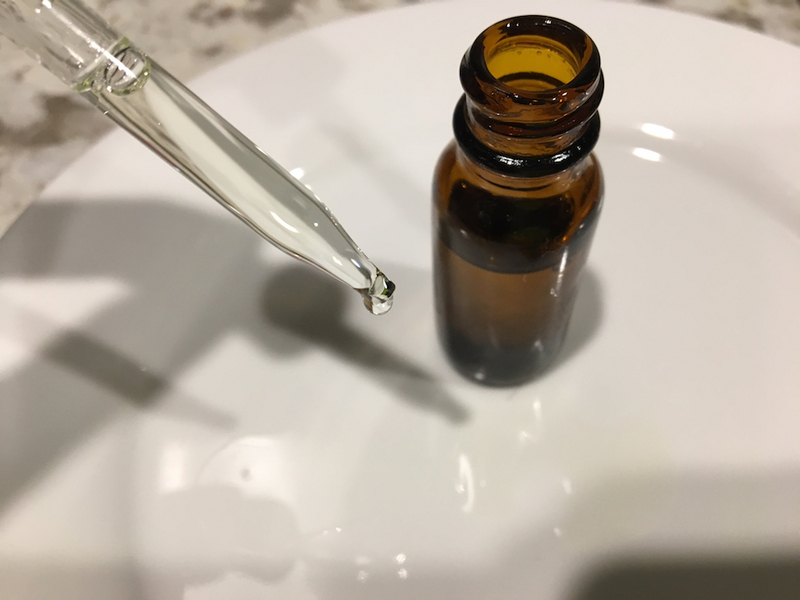 To get an efficient liquid-liquid extraction of the flavors in the oil, we need to create small droplets of oil in the ethanol solution. Image by JD. Licensed under CC BY 2.0, via Flickr Creative Commons. In an industrial process, where larger volumes are used, we can replace the shaking by letting the oil and ethanol flow through a liquid-liquid extraction column, such as a pulsed column. A complication in scaling up a bartender’s process is temperature. In an industrial column, some of the oil has time to solidify into fat. This means that the extraction column must be kept at a temperature high enough to prevent the oil from solidifying. To break the oil droplets into smaller droplets, we need to apply forces that exceed the surface tension that holds each droplet together. We can achieve this in an extraction column by pulsating the ethanol phase from top to bottom and the oil phase from bottom to top. Just like a bartender’s shaking motion, the pulsating enhances the transport of solutes to and from the droplets’ surfaces. where P denotes the partition coefficient and c is the concentration of a solute. If we examine one droplet at a microscopic scale, the rate of the solute’s transport between phases is determined by the transport from the bulk of the oil droplet to the phase boundary and from the phase boundary to the bulk of the ethanol phase. We need a very large surface area for the phase boundary to also get a large cross-sectional area for the solute flux moving to and from this boundary. According to the research of Gibbs, we have a surface phase that is a mixture of the oil and ethanol molecules, seen in the figure below. On each side of this surface phase, we have an equilibrium concentration of the solutes in the oil and ethanol phases. The relation between the two equilibrium concentrations for each solute is given by the partition coefficient. 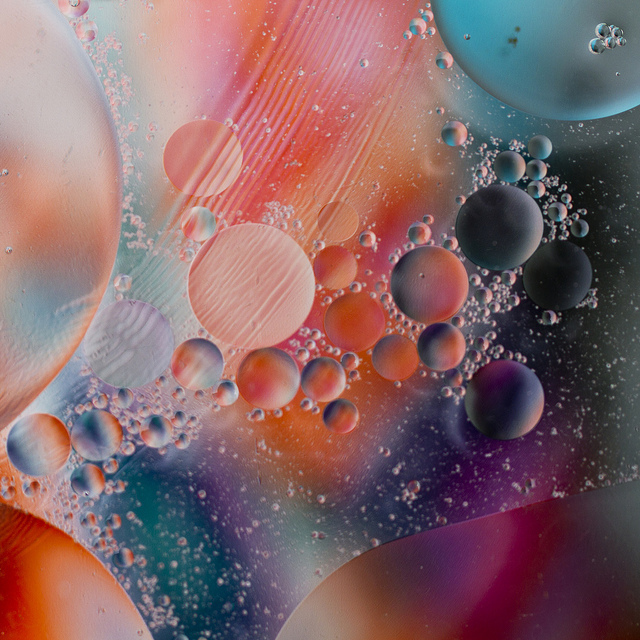 When the extraction starts, we have large gradients in the solute concentration both within the oil droplets and in the ethanol phase around the droplets, shown in the left figure below. When the extraction is complete, the concentration everywhere in the droplets and ethanol phase is equal to the equilibrium concentration according to the partition coefficient, as seen in the right figure below. An oil droplet (turquoise) in ethanol (blue) at the beginning of extraction (left) and after the extraction is complete (right). The graph shows the concentration along a line that runs perpendicular to the phase interface and across the interface. 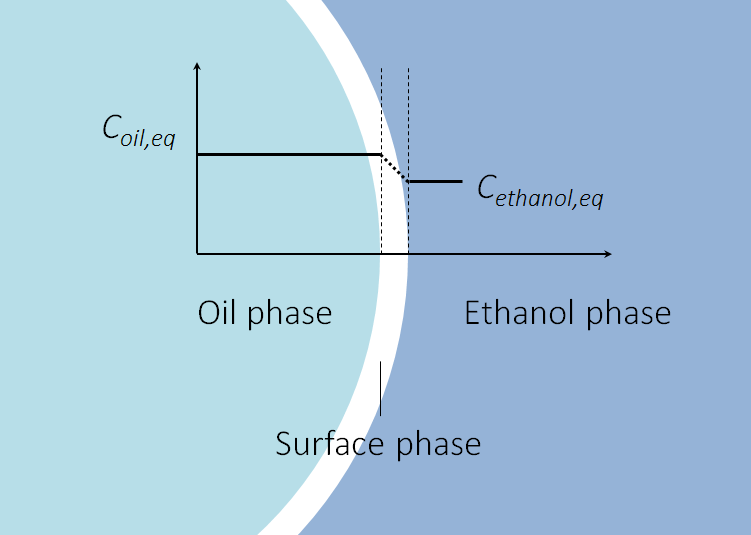 The oil and ethanol phases are separated by a surface phase that contains molecules from both phases. The animation below shows an oil droplet transferring a solute to the continuous phase (ethanol in our case) as it rises. As the bubble rises, it leaves a trace of the solute along its path. The stationary oil on top also contains the solute, but the transport is very slow until the droplet hits the surface, which produces some mixing at the phase boundary. An oil droplet rising in ethanol. As it moves, a solute is extracted from the droplet to the continuous ethanol phase. There is also a layer of oil resting on top of the ethanol. Studying one droplet, such as the rising oil droplet above, gives us a better understanding of the processes occurring at a microscopic scale. However, even at the scale of a cocktail, we are dealing with thousands of droplets. In such cases, we need to study the liquid-liquid extraction using dispersed two-phase flow models. In these models, we don’t deal with the exact shape of the interface between the oil and ethanol. Instead, we use variables for the volume fractions, bubble sizes, and specific interface area between the two phases. From the velocity difference between the phases, velocity gradients within each phase, volume fraction, number of droplets, and size distribution, we can estimate a mass transfer coefficient between the oil and ethanol phases. These types of dispersed models are used in the modeling and simulation of industrial liquid-liquid extraction columns. A two-phase flow mixture model of a liquid-liquid extraction column that shows where the oil fraction is high (red) and low (blue). 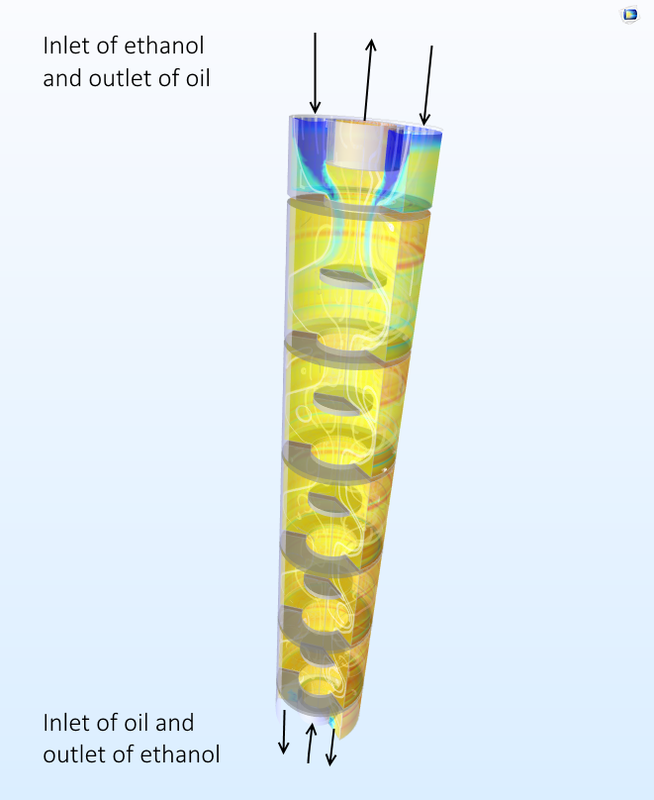 On average, the oil fraction is constant over the column, but it’s concentrated at the center of the oil’s inlet and outlet. The flow is countercurrent, with the ethanol flowing downward while the oil flows upward. There is plenty of time for extraction of flavors between the oil and ethanol. The liquid-liquid extraction process is finished when the partition of the species that may dissolve in both phases is at equilibrium. This does not mean that the concentration of the flavors is equal in the two phases, since the hydrophobic species always has a higher concentration in the oil phase and the concentration of the hydrophilic species is higher in the ethanol phase. 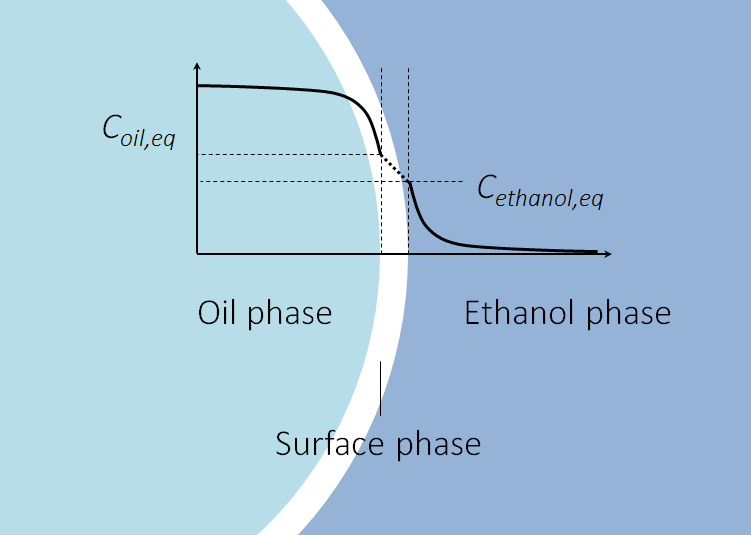 After the extraction is complete, the two-phase system must be allowed to rest in order for the oil phase to separate to the top of the ethanol as a continuous phase (instead of being a dispersed phase of droplets within the ethanol). Bartenders can achieve this by letting the shaker rest for a while. In an industrial column, the oil phase is separated at the top as a liquid phase, while the ethanol can be separated at the bottom of the column. The ethanol may still contain small droplets of dispersed oil, but we can use settling basins to separate out the remaining oil. 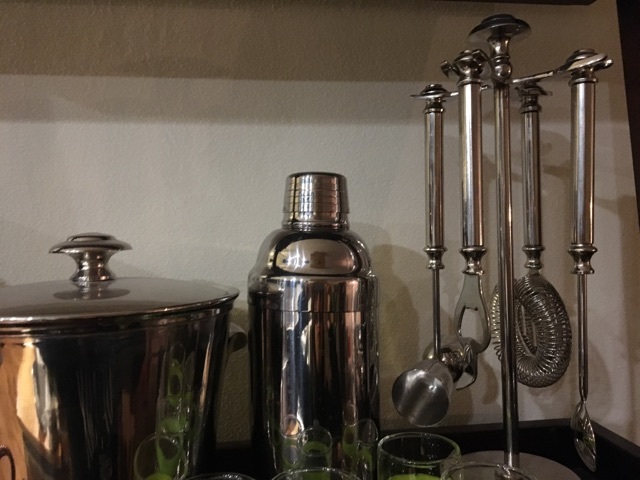 Once a bartender has two continuous separated phases in the shaker, he or she can put the two-phase liquid in the freezer. The frozen fat can then be removed as a solid cake. Then, the bartender removes any remaining pieces of fat left in the liquor with a tea strainer, leaving a clear liquor as the base for creating the cocktail. At an industrial scale, freezing the two-phase liquid just to remove the fat is inefficient. Instead, we can use settling basins, continuously removing the liquor at the basin’s bottom and letting an overflow outlet remove the fat from the top. At steady state, the settling basin has a thin film of oil resting on the ethanol, which also has the positive effect of slowing down ethanol evaporation. If some of the oil solidifies into fat, it can be gently scraped off with a surface scraper without agitating the basin. I must admit that I have not tried to fat-wash liquor myself. I feel a strong resistance against mixing perfectly good whiskey or bourbon with fat from frying bacon or ham. Perhaps I’ll try it with oak-infused vodka instead. That actually sounds delicious and feels closer to the oak flavors already present in whiskey and wine. Oak-infused water of life — or whiskey, as we usually call it. Then again, maybe I’ll just take my whiskey with an ice cube, while I study the Karman vortex street from a cigar.